The main task and objective of the company are to contribute toward various marketing activities to increase brand awareness, in accordance with the policies of Japanese Headquarters. The company also maps out and executes innovative sales promotions in associations with DHAS, who is our exclusive distributor in Thailand, in the aim of gaining loyal patronage of Thai people to our products. 1887 Niroku Masaki, with 10 employees, establishes the Masaki Pencil Manufacturing Company in Shinjuku, Tokyo. 1927 Beginning with Mexico, the company establishes the first of many direct export relationships. Around 1933, this is extended to include markets in India, Egypt, Portugal, Argentina, Belgium and Holland. 1946 At the end of World War II, the company recommences manufacturing and introduces the “No. 9800” pencil. 1958 October 1 of this year, sees the momentous launch of the highgrade “uni” pencil. The pencil meets with overwhelming public approval, chalking up sales far greater than anticipated, due to its superior quality and style. This lays the foundation for acceptance of the uni brand worldwide. 1959 After wrestling with the complexities of ball-point pen assembly, the company takes its first steps as an all-round stationery manufacturer, introducing its first ball-point pen. 1961 Product variety is subsequently extended by the launch of the company’s first mechanical pencil, with lead advance mechanism. 1979 Seeking more satisfactory writing performance of roller pens, the company introduces the “uni-ball”, the world’s first roller pen to incorporate a metal tip. The pen’s exceptionally smooth writing performance makes it an immediate hit in the Japanese and American markets, generating explosive sales. 1980 The oil-based “Paint Marker”, which allows the application of vivid colour to virtually any surface, is released. 1983 The inimitable water-based pigment ink marker, “Posca”, is introduced. It achieves immediate success with its ability to mark most surfaces without penetration and its superior colour brightness. It also features total water and fade resistance. 1986 In the year of the company’s 100th anniversary, Mitsubishi Pencil introduces the “Prockey”. A world first, this marker utilises a groundbreaking water-based ink. 1987 The world’s first pigment ink fluorescent highlighter, “Promark”, is launched. 1993 Greater consideration for user comfort results in the production of the “Laknock”, a ball-point pen with soft rubber grip for fatigue-free writing. 1994 The “uni-ball Signo” and “uni-ball eye” are released, featuring an extraordinary water-based pigment ink. 1997 The world’s first retractable gel-ink pen, “uni-ball Signo Retractable”, is introduced with newly developed non-dry gel ink and a twinball mechanism. 1998 The “uni-ball Signo broad” is released, with its 1.0 mm ball. This pen is capable of writing one of the world’s broadest lines in gel ink pens. It features smooth writing performance, is useful in a diverse range of situations and comes in a variety of colours. 1999 Newly-developed fine ceramic colour leads and mechanical pencils, known as “-ish”, are released. Although they deliver superior colour brightness, they are also readily erased as they don’t contain wax. Other excellent characteristics include high resistance to breakage and their ability to write on both light and dark papers. 2002 The world’s first clear ink roller ball “uni-ball fusion” with an amazing “clear to colour ink innovation” is introduced. 2003 New roller pen “JETSTREAM” is released, realized by the quick-drying “NEW ROLLERBALL INK”, which achieves a new, smooth and light feel. The evolution and revolution of gel ink “uni-ball Signo 207” is released, with scratch-free tip, long shelf-life and quick-drying. 2004 New correction pen “Click Correct” is released, with just one click and you can correct your errors easily. New whiteboard marker “inkview” is released, its transparent barrel [inkview] allows you to see the remaining ink easily. 2005 With the world smallest 0.18mm ball (as of January 2006) gelink pen “uni-ball Signo bit” is released. “uni-ball Signo PREMIER” with premium grip is released. New “uni-ball Signo UM- 120” with enhanced perfection and quality as a gel ink pen is released. Celebrates the 120th anniversary . 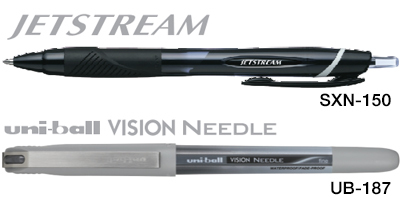 2007 The “uni-ball VISION NEEDLE” with needle tip is released. It produces a thin and precise line. We release retractable roller ball pen with liquid ink “uni-ball VISION RT”. 2008 The “uni-ball VISION NEEDLE” with needle tip is released. It produces a thin and precise line. We release retractable roller ball pen with liquid ink “uni-ball VISION RT”. 2010 New entry model of JETSTREAM “JETSTREAM 101” is released. New heat reaction erasable gel ink roller ball pen “uni-ball fanthom” is released. Retractable type of entry JETSTREAM “SXN-101” is released. The “uni Chalk marker” is released. It creates writing that stays on the board when it rains, but which can be cleaned off with a wet cloth.